A few hours before her public reading on 14 February, poet Mel Nichols recorded a short set at the home of Steve Evans and Jennifer Moxley. Here are a half-dozen tracks from that session, recorded at the dining room table on a pretty good microphone attached to a pretty cheap tape player, then digitized using Garageband, iTunes, and Audacity. 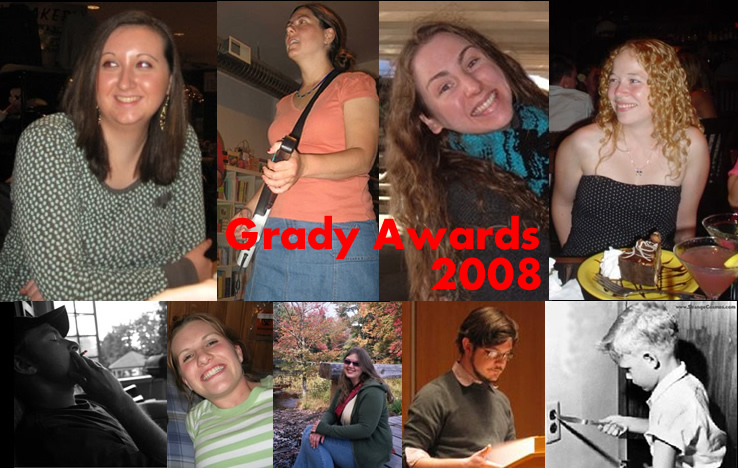 And Kyle Kernan gives an account of last Thursday’s Grady Awards reading here. Our thanks to the Maine Campus for keeping the NWS on its style beat! 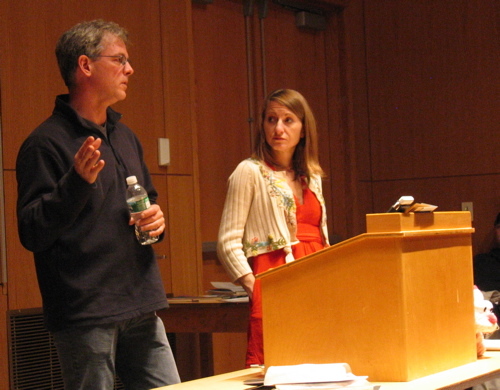 The spring NWS continues this Thursday with an afternoon reading and evening conversation featuring Catherine Taylor and Stephen Cope. 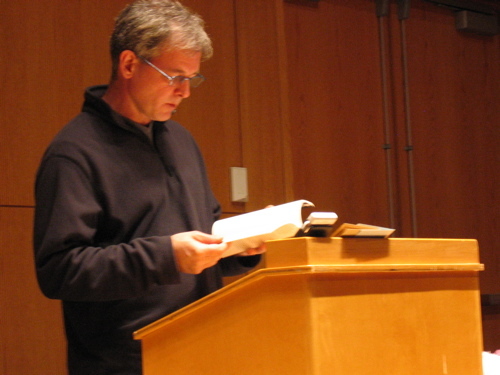 The reading will be at 4:30pm in the Soderberg Auditorium. The conversation, which will address questions of genre and editing as well as documentary poetics, with special reference to Cope’s new edition of George Oppen’s prose writing, will begin at 8pm in the Wicks Room, Neville 304. Both are free and open to the public. Stephen Cope’s poems, essays, and reviews have appeared or are forthcoming in XCP: Cross-Cultural Poetics, Mirage#4:Period(ical), Denver Quarterly, Shark, Sagetrieb, The Germ, Jacket, and elsewhere. 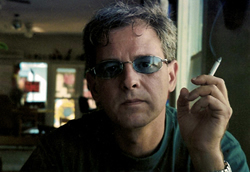 In Spring 2001, he served as guest editor of The Review of Contemporary Fiction’s special issue on the work of David Antin. 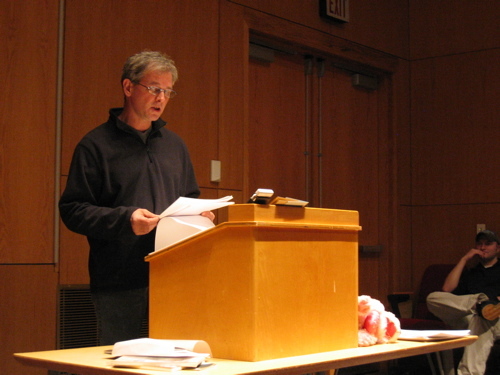 Cope received his PhD in 2005 from the University of California, San Diego, where he was a research fellow at the Archive for New Poetry. He has taught at universities in California, Iowa, and Ohio, and is currently a lecturer in the English Department at Ohio University in Athens as well as a faculty member in Bard College’s Language and Thinking program. 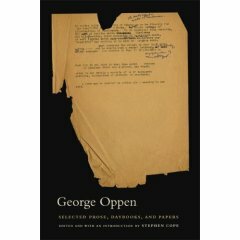 His edition of George Oppen’s Selected Prose, Daybooks, and Papers has just appeared from the University of California Press. 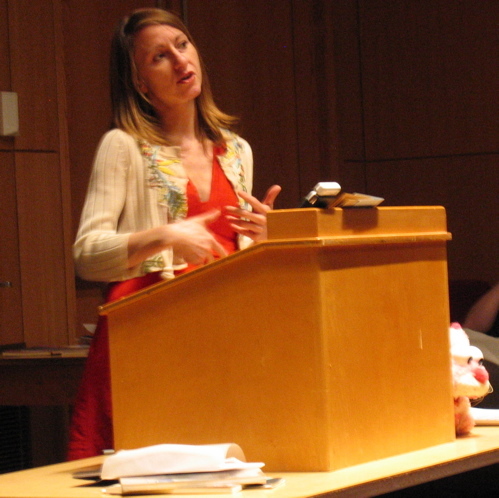 Catherine Taylor is the author of Giving Birth: A Journey Into the World of Mothers and Midwives (Penguin Putnam, 2002). She is the editor of /nor: New Ohio Review and publisher of Essay Press, an imprint dedicated to publishing innovative, explorative, and culturally relevant essays in book form. 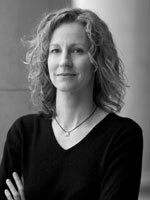 Taylor took her doctorate at Duke University and is currently an Assistant Professor of Creative Writing at Ohio University, where her research and teaching interests include documentary poetics, creative nonfiction, experimental writing, and American literary and cultural studies. 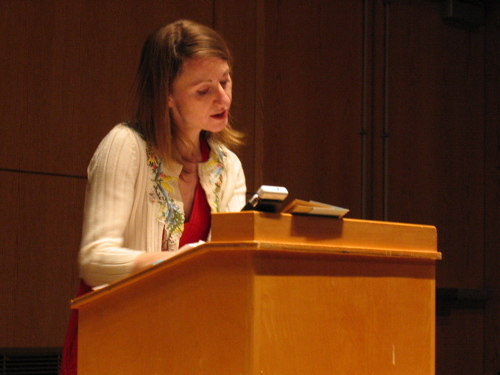 She is currently at work on “Apart,” a book manuscript that combines documentary materials with the lyric essay in an exploration of family and nation in apartheid-era and contemporary South Africa, the research for which was undertaken while Visiting Professor at the Centre for African Studies at the University of Cape Town in 2004 and 2006. Her essays, poetry, and reviews have recently appeared or are forthcoming in Typo, Xantippe, The Colorado Review, The Laurel Review, Jacket, and ActionYes! Approximately thirty-five people turned out to hear a Valentine’s Day reading by D.C.-based poets Mel Nichols and Rod Smith. 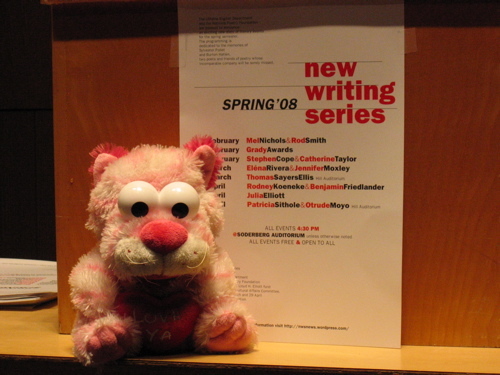 The first event of the spring ’08 NWS featured new work by both writers and a lively question and answer session. 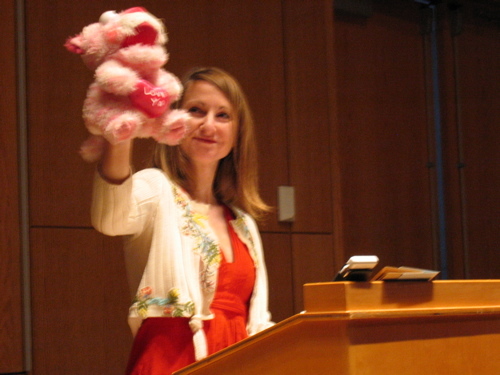 Oh, and a singing puppet. And Flarf. And…. Full set-lists are on their way, as are some audio highlights. In the meantime, a few snaps from the event. It just called to say it loved you…. 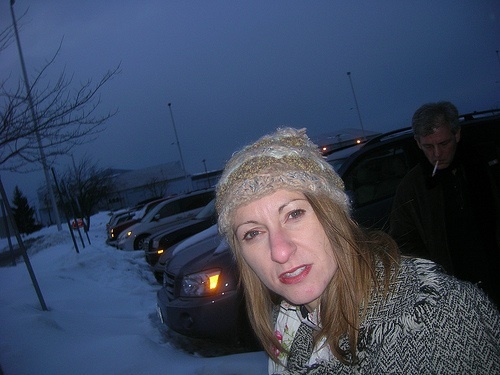 Rebecca Griffin comes to Orono from Somerville, Massachusetts where she worked as an editor for several years. She loves living near her extended family in Orono, and is thrilled to be a frequent attendee of local bean suppers and church fairs. In addition to writing poetry, she enjoys cooking, walking around town, and chasing her cat around her house. Emily Kohler graduated from Ohio University with a degree in English and a minor in Classical Civilizations. Her interests include kayaks; road trips; Kevin Spacey; Pilot black ink, retractable, fine point pens; and all things Italian. She is a second year teaching assistant in the English department. I am a fourth year English major with a concentration in creative writing poetry. I am graduating in May, and plan to take a year off before attending Grad school in 2009 to earn an MFA in creative writing. I enjoy reading and writing when I can find the time, and I love all Boston sports teams, especially the Patriots and the Bruins. Someday I would love to travel to and maybe live in Tuscany, Italy. Nicholas Mohlmann was born and raised in Virginia. He earned a BA in English from George Mason University in 2005. He is currently finishing his second year as a grad student in the English department and will complete his MA in May. Zachary Richards was born in Ellsworth, Maine on October 3, 1984, and grew up in the small coastal town of Roque Bluffs, Maine. He began attending the University of Maine in September of 2002 and graduated with his Bachelor of Science degree in Electrical Engineering in May of 2006. While an undergraduate he also completed minors in Mathematics and English. He returned to the University of Maine in September of 2006 to pursue a Master of Science degree in Electrical Engineering. I am a senior-year English major (concentration in creative writing). I am passionate about reading, writing and theatre, and sometimes try my hand at playwriting for fun. One of my favorite things to do in my free time is have a good conversation. Clinton Spaulding was born in Hartford, Connecticut and moved to Maine as a child where he learned to hunt, fish, and enjoy the wilderness. Since then he has traveled extensively throughout the U.S. living in Arkansas, Massachusetts, and was stationed in Corpus Christi, Texas while in the Navy. He is now back in Maine writing poetry and raising two kids free from the clutches of censorship. Special thanks to guest judges Edward Desautels (fiction, NWS F’07) & Daniel Bouchard (poetry, NWS S’01 & S’05). Poets Rod Smith and Mel Nichols kick off this spring’s New Writing Series on Valentine’s Day at 4:30pm in the Soderberg Auditorium. 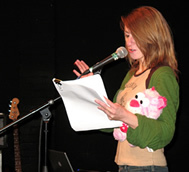 Nichols is the author of Day Poems and The Beginning of Beauty (Part 1: hottest new ringtones mnichol6). You can read more about her here. And see a YouTube clip here. Rod Smith first read in the NWS in the fall of 2000. You can read about him here. His most recent book, Deed, was reviewed in The Nation in December. He’s on YouTube, too.